Ages ago, I wrote about “should” and what I define as the right and wrong way to use that word. Recently, while speaking with one of my various coaches, I mentioned that something was expected. Her response was that an expectation is just as bad as a should. And I realized that it was time to dust of the “Should” blog and expand on it. While I didn’t actually say it explicitly in the last blog, “should” is how others put their opinions on you. Opinions you may not care for or agree with. Even when you say it about yourself, if you dig into that “should” I bet you’ll find it is based on someone else’s need, desire, or opinion. You don’t need to “should” yourself for your own needs, desires, or opinions, you just take care of them. I expect to read it. I expect him later. She expects that they will come. I expect that you are tired from the trip. Paul and Sylvia expect their second very soon. The first one is when I generally agree with the use of the word. If you are expecting someone to arrive, it is probably because they told you they were coming. You have reason to expect them to show up. If they did not tell you they were coming, then you have an unreasonable expectation. It’s the second definition I have an issue with. Well, I found Dictionary.com’s definition awkward, that’s why I added Merriam-Webster’s. The example, however, is perfect – just because you expect obedience, does not mean I will be obedient. Especially when you put it to me that way. So, I have two points here. You are you, not anyone else. Do what works for you. When you are presenting ideas (ah, the writing point), be cautious of the words you use. I find that my ideas, my opinions, find more acceptance when they are provided neutrally. 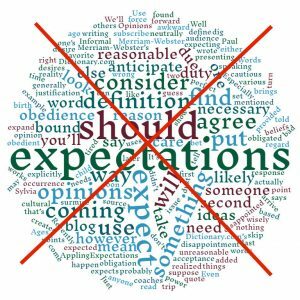 Appling force to them – such as a should or expectation – is likely to turn off your audience. Words do have power. Use yours wisely. ← Why Beat About the Bush? Everyone Just gets Lost.